You can make a video file(AVI,WMV,RM,MOV) from 3D games by Gregion. - Apply Codec(DivX, XviD, ...) to the video stream in real time. 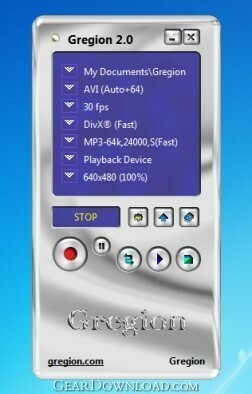 - Make an optimal AVI file by Gregion Converter after Lossless capture. - Can include a Mouse Cursor and User Logo and Date Time in the video stream. - Can include a User Informations in the video file. - Can reduce the video for capture. - Can reserve a time limit for capture. - Convert WMV (ASF) file to AVI file by general Codec. This download (gregion.exe) was tested thoroughly and was found 100% clean. Click "Report Spyware" link on the top if you found this software contains any form of malware, including but not limited to: spyware, viruses, trojans and backdoors.